The idea that style is neutral, that style choices are merely preference choices, reveals a deep worldview flaw that cannot be ignored. To argue that style is a matter of preference is to say that there are areas in this world over which God makes no claim, over which Jesus Christ is not Lord. If in fact, the Lordship of Jesus Christ does not extend to our style choices, then anything goes. Why not host a Pajama Sunday? After all, how else will we reach late-night WalMart shoppers? 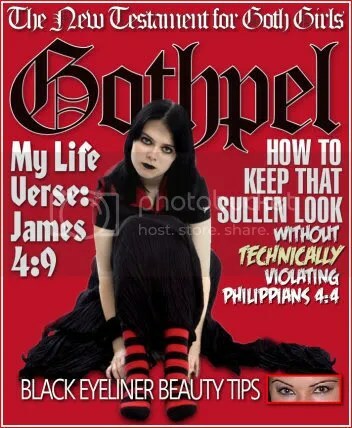 Better yet, how about Goths for Jesus preaching the Gothpel? There is no neutral ground in the universe. Every square inch, every split second is claimed by God, and counterclaimed by Satan. As Christians, we must set apart Jesus Christ as Lord in every part of our lives (I Peter 3:15), including in our style choices. To say that style is a matter of preference, that God says nothing about it, is to say something other than that Jesus is Lord. Of all things, style is not neutral. Style sends a clear message. Style informs us of the meaning of the occasion. But when people make style choices for an occasion, they also inform us of their attitude toward the occasion. Those who pop into the wedding wearing shorts and a t-shirt state very clearly what they believe about the significance of a wedding. Even the most casual observer gets the message. Consider, for instance, two renditions of “Be Still My Soul.” I won’t offer any commentary on the two styles, though I certainly have an opinion about both. I offer these as Exhibit A and Exhibit B in my case that style is not neutral. Listen to the first, then listen to the second. You only need to listen to about 30 seconds of each to get the point. Surely, you recognize that the different styles between the two versions of the song changed the meaning of the song. Style conveys the message. Style, in fact, is the message. Whether the discussion is about music, clothing, lighting, or platform arrangement, style informs us of the meaning and importance of the occasion as much as anything else does. The Contemporary Independent Baptists know this. They are smart, media-savvy guys. They grew up in Independent Baptist Churches. Their dads have been pastors for many years. They know what style says about a church. These young men have grown their churches into the 1,000’s. They didn’t achieve that success by being naïve or ignorant. They know what they are doing when they broadcast their contemporary worship style on the Internet. They include highlights from their contemporary services in order to send a message, and those who visit their websites know exactly what they are saying. So the claim that style is neutral or indifferent simply doesn’t hold water. This is one of my biggest gripes about the contemporaries – they feign ignorance and pretend naivety about the message they send with their style choices. They claim that they aren’t trying to attract any certain crowd to their churches. They just want to worship God. And their worship is no different than ours – one style is as good as another, as long as we are all worshipping God. While I disagree with the contemporaries, I still wish they would be straightforward about their purpose. The idea that style is nothing more than a grab bag full of neutral options comes from a deeper error, further upstream. That error stems from the fact that modern Christians have divorced beauty from truth and goodness. While we believe in objective truth and objective goodness, we believe that beauty – and style rightly belongs to beauty – is somehow subjective. Throughout the ages prior to this modern era, Christians have rightly fought against the idea of subjective truth. We have defended objective moral standards against the attacks of relativism. But when it comes to style and beauty, many have fully embraced relativism. As a result, we believe that beauty is disconnected from truth and goodness. The Bible teaches that “He hath made every thing beautiful in his time” (Ecclesiastes 3:11). The Bible speaks of beauty more than seventy different times, ranging from beautiful clothing to beautiful people. Surely, God means something by this. The idea that beauty is “in the eyes of the beholder” is not gospel truth. Certainly, our humanity and our fallenness limit our perspective of beauty so that we cannot see all that is beautiful the way that God does. But our perspective is not authoritative. Our perspective is finite. God knows exhaustively what He means when He speaks of beauty. Though we can know what He means in partialities, He knows absolutely. As with everything else, we can know more perfectly as we learn to think God’s thoughts after Him. God is not silent on the subject of style and beauty. He reveals the objective standard of beauty in Himself. God is the standard of all beauty. He is Himself altogether lovely, fairer than the fairest. All ultimate loveliness and beauty rest in the Triune God. He is the source and spring, the fount of all that is beautiful. As our Creator God, He has not simply created a great variety of creatures and things in the material world. He has created works of art. He has created a beautiful world and filled that world with beautiful things. The claim that style is simply a preference choice, that style is neutral and thus a matter of indifference is a denial that there is such a thing as objective beauty. It is to relegate style to the subjective, to claim that it is all the same. Style certainly is not all the same. Style communicates in clear, objective, and meaningful ways. And it does so because this is the way God made the world. God does speak of style in the Bible. In fact, He demands that we worship Him with reverence and godly fear (Hebrews 12:28). These things have objective meaning. They are not just found in our spirit or attitude. Our style choices – whether clothing, platform, music, or lighting – must display our reverence for God. As a rule, we must put “transcendence” above “trendy.” Because we gather in the name of God in order to show forth His glory and praise, we must show reverence to God the way our culture shows reverence. And yes, our culture does still maintain certain clothing, music, and decorum that demonstrates respect. Consider also the description of worship provided us in Hebrews. Wherefore we receiving a kingdom which cannot be moved, let us have grace, whereby we may serve God acceptably with reverence and godly fear: For our God is a consuming fire. Compare that to Isaiah’s prophetic description of Christ’s church. If style is simply a matter of preference, then style choices are a matter of utility, and that gives us pragmatism. Whatever you worship will dictate the way you worship. Those who worship success make style choices based on their desire to achieve success. That is pragmatism. But those who worship the God of the Bible will make their style choices in submission to God. In many ways, the contemporary church has become like the strange woman in the Bible, trying to attract the world by showing a little leg. Isaiah’s prophecy concerning the daughters of Zion “walking and mincing as they go” surely applies. If we come together for worship, and if we worship God (as opposed to success), then we will have different standards. We won’t advertise our style, because we aren’t trying to appeal to an unbelieving world. We will adjust our style in favor of sanctification, reverence, and godly fear. If we truly worship the God of the Bible, then any pragmatic considerations will be aimed toward making it possible to worship Him more faithfully and fervently. Our style will reflect our desire for the glory of God and will display His majesty. And as we worship the Lord in the beauty of holiness, we will enjoy more of His glory, and delight more in His praise.